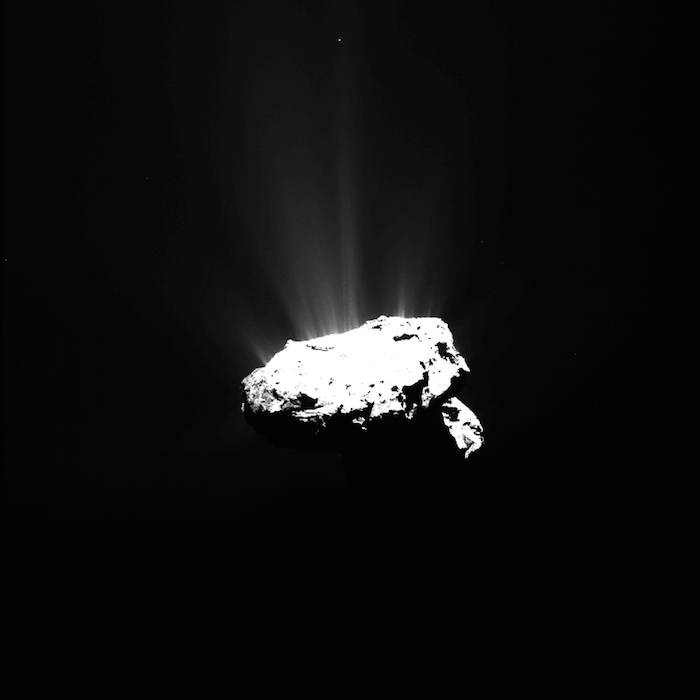 You can also watch a replay of the Google+ Hangout with Rosetta mission experts that was broadcast on 13 August 2015. 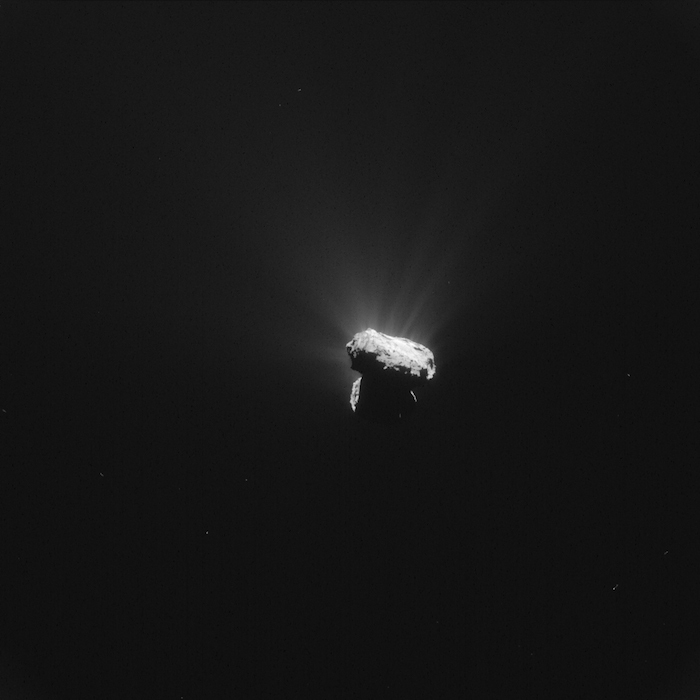 Extreme thermal stresses experienced by a comet as it orbits around the Sun could explain the extensive fracturing thought to drive its long-term surface erosion, say Rosetta scientists analysing high-resolution images of Comet 67P/Churyumov-Gerasimenko’s surface. 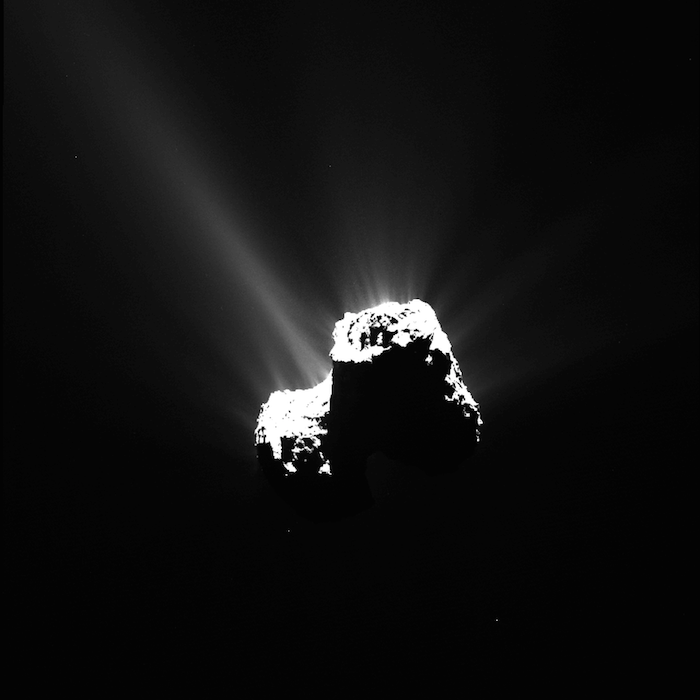 The study, which is published online in the journal Geophysical Research Letters, is based on images taken between 6 August 2014 – when Rosetta first arrived at the comet – and 1 March 2015, and includes detailed images acquired from between just 8 and 18 km from the comet’s surface. Ramy’s team identified three distinct settings in which the fractures occur: networks of long narrow fractures, fractures on cliffs and fractured boulders. 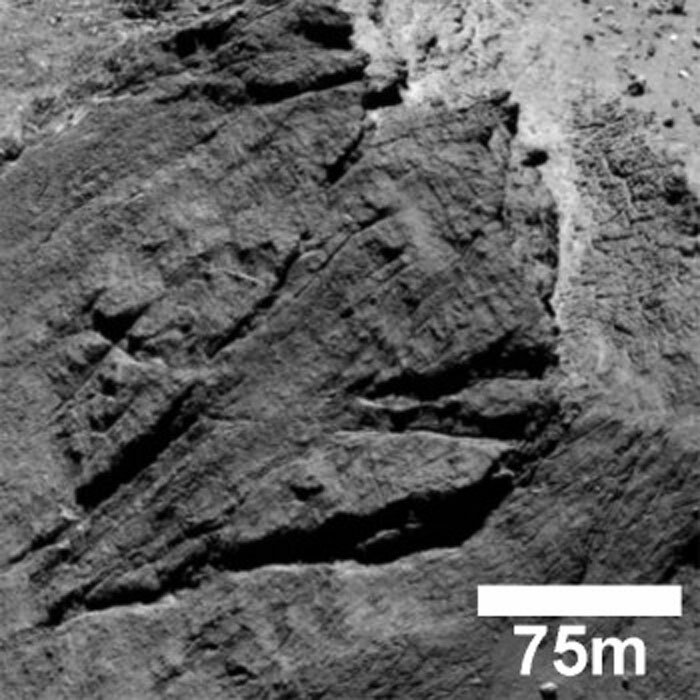 In addition, several unique features were identified: the parallel fractures running across Hathor’s 900 m-high cliffs, an isolated 500 metre-long crevice in the Anuket region of the comet’s neck, and a 200 m-long complex crack system in Aker on the large lobe. “The fractures show a variety of morphologies and occur all over the surface and at all scales: they are found in the towering 900 m-high cliffs of Hathor right down to the surfaces of boulders a few metres across,” describes lead author M. Ramy El-Maarry from the University of Bern. The most prevalent setting appears to be networks of narrow fractures that extend for a few metres to 250 m in length, typically on relatively flat surfaces. Interestingly, in some locations, the fractures appear to cross cut each other in polygonal patterns at angles of 90º – on Earth and Mars this is often an indicator of ice that has contracted below the surface. 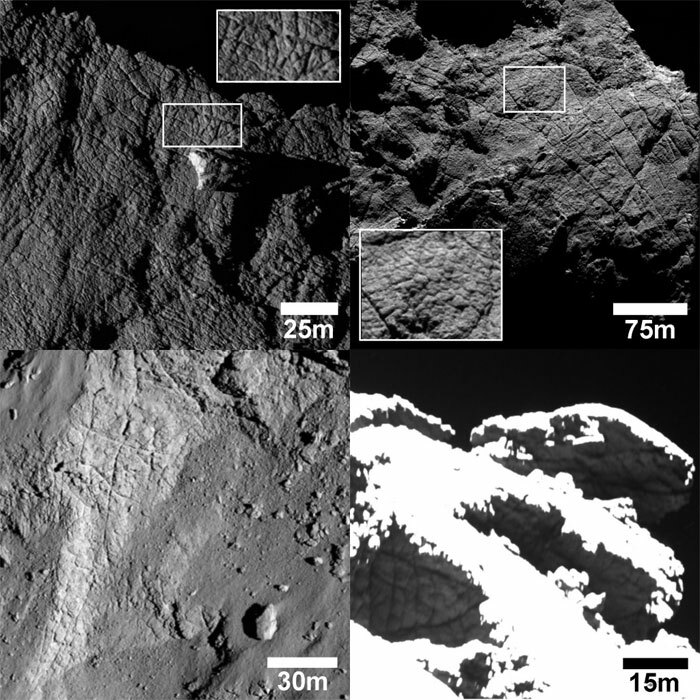 Another family of cross-cutting fractures is observed on cliff faces, such as in the Seth region on the comet’s large lobe, with debris deposits littering their bases. 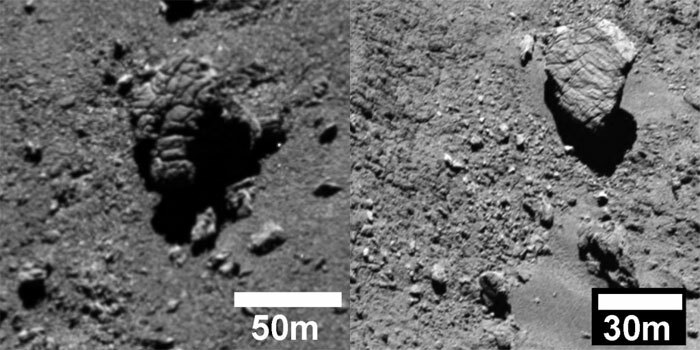 Fractured cliff faces were also observed at Abydos, the final landing site of Philae on the small lobe, as recorded in images from the lander. The fact that the fractures cut across each other in different directions suggests that the stress direction changes over time. 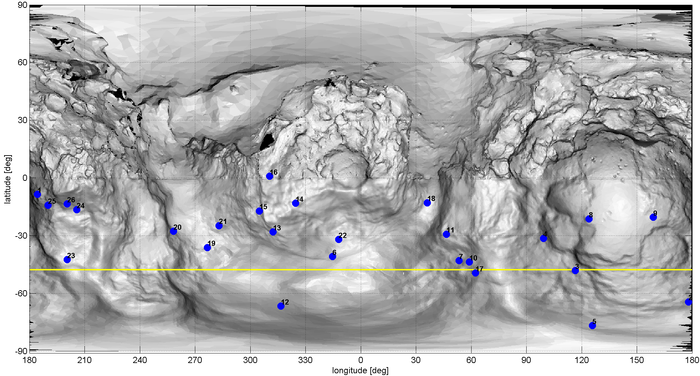 At the smallest scale, fractures are observed on boulders (in this study, boulders 20-60 m wide were analysed). In some cases it is clear that the fractures run through the boulders, pervasively fracturing them, while other fractures appear confined to the boulder’s surfaces. Taken together, the fracturing points to an erosional sequence leading to the boulders’ eventual fragmentation. Scientists think that the majority of these fracture patterns are most likely linked to the thermal history of the comet and result from stresses that stretch the comet’s surface apart. On Earth and Mars at least, these ‘tensile’ fractures can develop through several common processes: loss of volatile materials, thermal contraction or contraction and expansion cycles, and tectonic processes. In addition to throwing off volatile materials as they near the Sun, comets are known to undergo high fluctuations in surface and subsurface temperature on daily and seasonal timeframes. 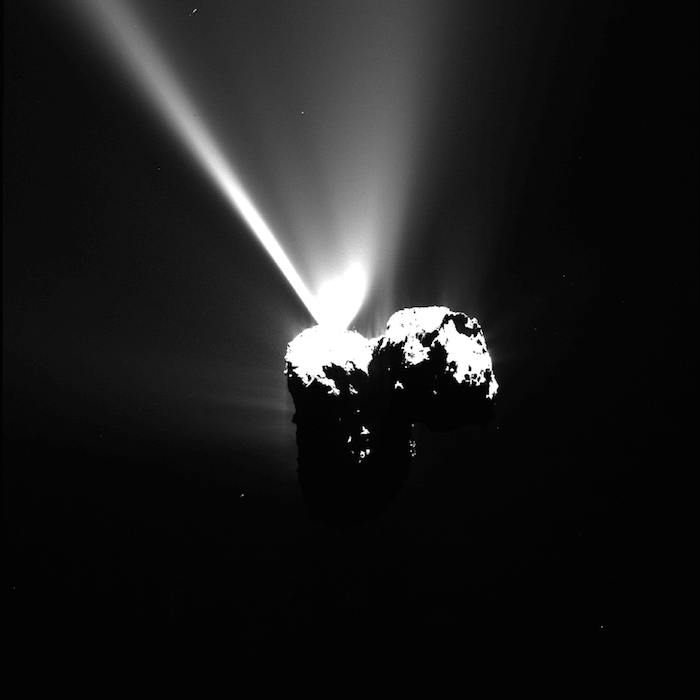 This continuous thermal ‘shock’ leads to weakening or “fatigue” of the surface both on the short term due to daily heating cycles, and on the long term as the seasons change along the comet’s 6.5 year orbit around the Sun. Regardless of the origin of individual fracture systems, it is clear that fracturing plays an important role in the evolution of the comet’s surface. 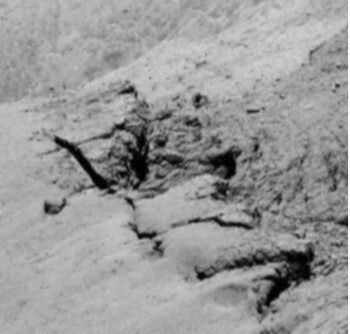 Fractures observed in cliffs, with debris observed at their bases, imply that this phenomenon represents the first stage in the overall ‘mass-wasting’ of the comet: the cliff top is weakened and a landslide-type event ensues. But, over long periods this process would act to erode the surface and flatten the landscape. 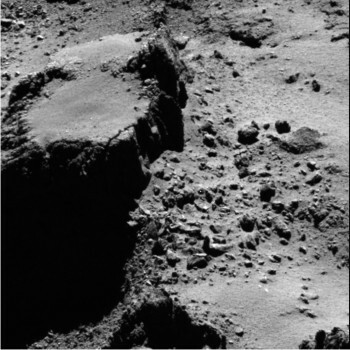 The fact that there are many rough terrains on the comet suggests that it has either not gone through very many erosional cycles or other processes are acting against this to roughen the surface, such as explosive jet activity. 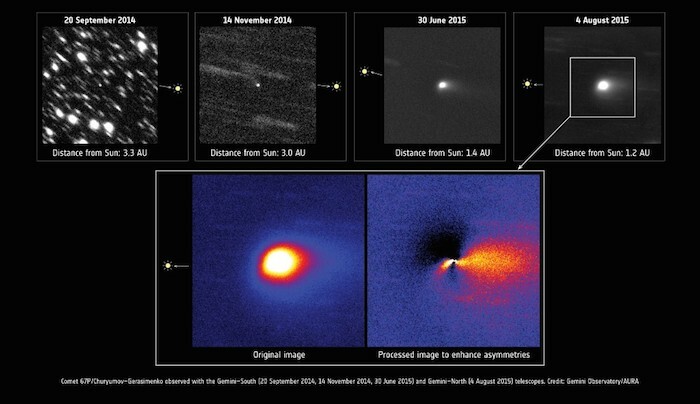 “Monitoring for changes in these fracture systems after the current perihelion phase, and running models to simulate the evolution of the comet over time, will enable us to test our various hypotheses for fracture formation,” adds Ramy.